While national cultures and policies shape women’s participation in national workforces, sectoral cultures and practices also play a significant role. Today’s leaders have inherited company and industry cultures in which women participate to varying degrees. 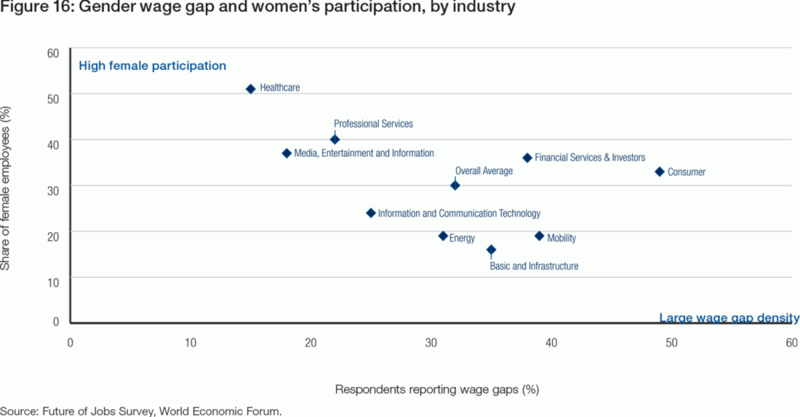 Across all industries, women’s workforce participation at junior, middle and senior levels is dramatically different. Projecting their figures for 2020, companies expect some improvement, spread unevenly across different industries. However, across all industries there is a narrowing female talent pipeline heading towards senior management. Having invested in women as they enter in junior positions, employers appear to frequently lose their investment by failing to retain talent up the ladder (Table 13). On average, responding CHROs predict that the gender composition of today’s junior roles will be reflected in 2020’s mid-level roles, and that the gender breakdown of today’s mid-level roles will similarly carry through to 2020’s senior roles. Across industries, there are expectations of a 7 to 9 percentage point increase in the share of women in mid-level roles by 2020 and an 8 to 13 percentage point increase in senior roles. This suggests an expectation that the workforce strategies employed to promote gender parity will be successful in retaining and promoting the majority of incoming female talent, against past experience. The projections for industries’ gender composition for senior, middle and junior roles in 2020 build on varying proportions today. Four industries—Basic and Infrastructure, Energy, Mobility and Information and Communication Technology—currently report a particularly low overall female workforce participation: 16%, 19%, 19% and 24%, respectively (Table 12). Additionally, these industries also report a more dramatic drop off of female employees between junior and senior level positions. In Information and Communication Technology, women currently make up 11% of senior level roles and 32% of junior level roles. Low intake of women at the junior level translates to similar underperformance later in the pipeline. Industries that have a comparatively high proportion of women in junior positions include: Financial Services & Investors, Healthcare, Media, Entertainment and Information and Consumer. Conversely, the Information and Communication Technology, Mobility, Energy, and Basic and Infrastructure sectors recruit fewer women into junior positions. While employers in the Basic and Infrastructure industry currently recruit a mere 22% women as part of their junior level staff, employers project that they will, on average, expand that figure to 29% in 2020. Fulfilling that prediction would see the Energy sector become the industry with the lowest proportion of women in entry level roles by 2020. However, following current predictions, Basic and Infrastructure will still remain the industry with the worst gender balance in senior roles. These numbers reveal that companies are focusing primarily on progressing women through the pipeline to avoid losing already developed or developing talent. Few industries are targeting strong increases when it comes to hiring women into junior and entry level roles. Employers in the Healthcare and Basic and Infrastructure industries are targeting a 7 percentage point increase. Mobility employers expect to improve their initial intake by 5 percentage points. The least ambitious targets for junior level hiring are in Financial Services & Investors, Media, Entertainment and Information and Information and Communication Technology. Financial Services & Investors companies report high junior level recruitment—around 43% of their workforce at this level is female. On the other hand, Information and Communication Technology reports a 10% lower share of junior recruits, making the proportion of women at entry level 34%. The gender balance of women on boards is similar or better to the proportion of women in senior roles. At the CEO level, however, women remain profoundly under-represented. The breakdown of women in line and staff roles highlights some of the barriers to top level positions. Women are under-represented in line roles in Mobility, Information and Communication Technology, Energy and Basic and Infrastructure, with line roles more likely to equip women with the skills and experience that would prepare them for senior positions. On average, the Mobility, Information and Communication Technology and Media, Entertainment and Information sectors are expecting to close the gap in women’s line and staff role participation by 4to 6 percentage points over the 2015-2020 period. Overall, the figures paint a challening picture. Across all industries, companies reported that they found women harder to recruit. The reported ease (or in this case, difficulty) of recruiting women is directly proportional to the existing gender composition of the industry. Persistent gender wage gaps are reported across all industries, even in industries where female participation is comparatively high (See Table 14 and Figure 16). The highest share of respondents stating that there was a wage gap in their industry is in the Consumer sector (49%), followed by Mobility, Financial Services & Investors and Basic and Infrastructure. That is, gender wage gaps are not always directly symmetrical to the magnitude of women’s participation in the respective industry.